I’ve said it many times before, I love doing styled photo shoots. What isn’t to love? I get to work with a group of talented wedding pros who all get to stretch their creative wings to make a gorgeous photo shoot. And in some cases, like my tropical wedding invitations, you get lucky and they are published in print! This photo shoot was published in Destination I Do Magazine and it even made the cover. I was asked to be a part of this shoot only a few days before it took place. 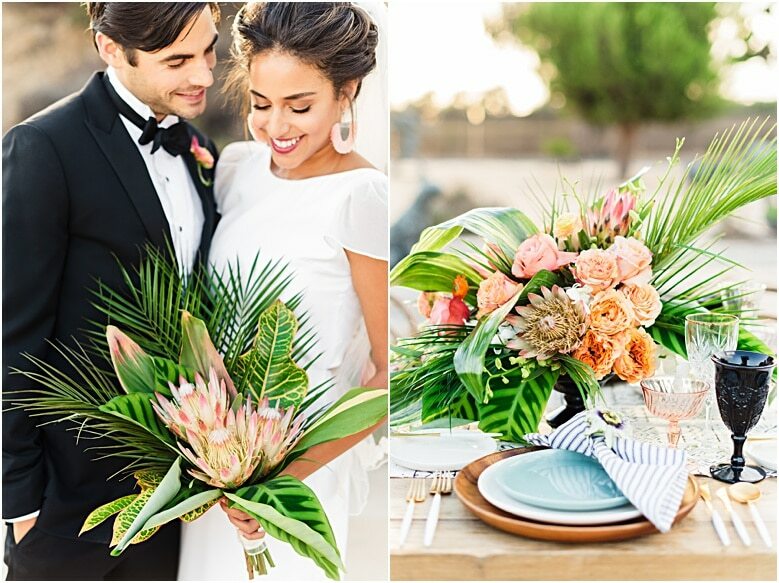 Gather Events gave me the guidelines of “palm fronds on the invitations and something more modern – like black and white”. Not having any idea what the rest of the shoot details were like, I decided to provide three different invitations and menus for the team to choose from. The first is the black invitation with gold calligraphy that was pictured in the magazine. The second and third are two different tropical wedding invitations. The first white invitation is die cut to shape in white and the second white invitation is a more simple design. I have worked for years with Be Inspired PR. They have gotten my worked publish countless times. Check out some of the other press pieces here, here, here, and here! The entire team put together an incredible tropical wedding and no detail was overlooked. For example, the black glasses on the tabletop are completely unexpected for a tropical wedding but give it the modern edge the team wanted. You can see the full list of vendors below. Be sure to check them all out.